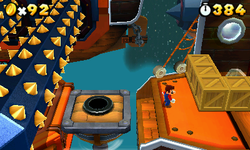 World 6- Airship is the airship level of World 6 in Super Mario 3D Land. This Airship level takes place in nighttime. Mario lands on an Airship with two Skewers and Question Blocks, shortly before a Rocky Wrench that tosses Bob-ombs. Jumping toward another Airship, he must travel through Crates and two vertically positioned Skewers. Going to the right, an Airship with three purple arrow blocks, a Skewer and a Rocky Wrench is found. Scrolling up, Mario must dodge two Skewers until reach on a pink Airship with a Warp Pipe. It takes Mario to Pom Pom's room, divided in seven parts by burning wires. After Mario beats Pom Pom, another Warp Pipe leads Mario to an Airship with many Coins, a + Clock and the giant Goal Pole. Star Medal 1: After passing the first two Skewers, there should be a bunch of crates concealing the first medal. Star Medal 2: After passing another two Skewers, the player should quickly hit the three purple blocks in order to be able to reach this medal. Star Medal 3: Once the player passes the last three Skewers, they should wall jump where they see the shadow of the medal, found on the top left platform directly after.